Pragmatic Arguments | J.W. Wartick -"Always Have a Reason"
For some time, I’d been wanting to put some effort into studying Pascal’s Wager. I picked up Pascal’s Wager: Pragmatic Arguments and Belief in God by Jeff Jordan in order to familiarize myself more with the philosophical grounding behind the argument. Jordan approaches the Wager through a lens of analytic philosophy and, I think, demonstrates that the argument has some force to it. Jordan’s work has great scope. Several aspects of the Wager are brought to light. He analyzes several different formulations of the argument, while also noting where the argument has been changed or modernized. For example, the notion that Pascal’s Wager was infinite bad vs. infinite good is a more recent innovation than Pascal’s original argument. He studies the argument contextually to determine whether the Wager was intended as a generalized theistic proof or an argument for Christianity. Numerous objections from leading critics of the Wager are put to the test. Ultimately, a version of the Wager developed by William James is put forward as an argument that passes the philosophical muster. Jordan analyzes this argument from many angles, ultimately demonstrating that it overcomes the challenge of the “many gods” objection and provides grounds for Christian faith. The value of Pascal’s Wager may is increased by the fact that many aspects of Jordan’s work are applicable to other arguments or areas of interest for philosophers of religion and apologists. For example, Jordan raises significant challenges to the notion that philosopher’s fictional deities may actually be counted as evidence for a “many gods” objection (75-76; 80-81). Another example is a rather interesting argument he derives from the work of James Beattie (1735-1803- Jordan notes Beattie is at times rightly accused of misrepresenting Hume’s arguments) about whether attempts to deconvert might bring about pragmatic wrongs (190-194). These and other tantalizing topics command even more interest than the book might otherwise have had. 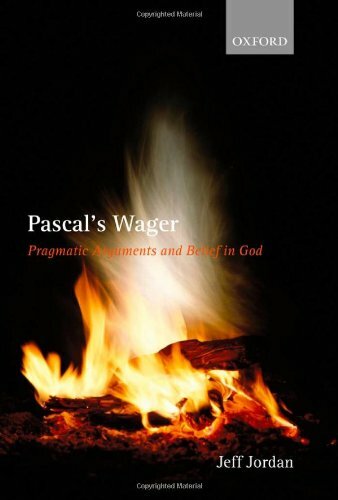 Simply put, Pascal’s Wager: Pragmatic Arguments and Belief in God is a phenomenal, thought-provoking work that will have readers rethinking their evaluation not only of the (in)famous Wager but also of a number of related topics. Even at its steep price tag, the book is a bargain. Pascal’s Wager: The Utility Argument Examined– I outline and defend one of the versions of Pascal’s Wager which Jordan brings up in this work. I find it to be a very interesting argument and a great addition to the apologist’s toolkit. …I realized that Pascal’s Wager is a much stronger argument than I had thought. Let’s get it out of the way: Pascal’s Wager does not have much “street cred.” It’s much-maligned as nothing more than rolling the dice, and doing so for no good reason. After all, on which deity should one wager? Here, I’ll take a look at one formulation of Pascal’s Wager, then very briefly offer a way to perhaps circumvent the “many gods” objection. I’ll be relying heavily upon Jeff Jordan’s book, Pascal’s Wager: Pragmatic Arguments and Belief in God, in what follows. Now, this is a pretty straightforward argument. 3, the conclusion, follows via modus ponens. Thus, it is up to the one who wants to deny 3 to deny one of the premises. Let’s examine each in turn. Premise 1 seems to be logical, but it has actually garnered just as many objections as the second premise. Some have argued that one should not reduce belief in God to a “gamble” or some pragmatic choice. Others have argued that one cannot simply choose to believe and argued that the Wager results in Doxastic Voluntarism–the notion that one may simply change beliefs at will. In order to combat each objection in turn, one would have to show that it may be permissible to choose pragmatically even in religion. Jordan argues to this effect at length, but for the sake of argument I think it may be enough to just say that generally, we do make choices which we think will benefit us, and this is not an objectionable path of reasoning. Moreover, the Wager does not reduce to doxastic voluntarism, for one may indeed change one’s disposition toward something, but not at will. This is a complex argument, and I think we may set it aside for now because there is nothing in Premise 1 which would demand doxastic voluntarism. Premise 2, of course, is highly contentious as well. Some allege that belief in God prevents the joys of hedonistic living; others allege that one would not know which deity to choose; still others would argue that there could exist deities that would reward unbelief. Again, dealing with each in turn would take quite some time, so I’ll simply offer a few comments. First, hedonistic living in one life would not outweigh the benefits of eternity with a benevolent deity. Second, the Wager may simply be used to prefer theism generally–after all, if one does not wager on any deity, there would be no possibility of infinite (or nearly limitless) expected utility from one’s wager. Third, inventing fictions to attempt to rival established religious traditions which have, presumably, been believed by our epistemic peers (to use the term of Jordan, 80-81) does not put them on par. Now, it should be fairly clear that even an incredibly low probability for God’s existence may have much higher expected utility than unbelief, for the overall possible gain is much higher. Jordan elaborates on this and answers many objections (such as the notion that “betting” on something which is highly improbable is necessarily irrational). For now, I simply leave this statement hanging because it helps my purpose, which is to demonstrate to those interested that the Wager is worth investigating further. Because of the above, another of the strengths of the argument may be found in its usefulness to the apologist. Pascal’s Wager, Jordan argued, may be viewed as a kind of “last ditch” argument for apologists and theism (24). After all, suppose one were to come up with an argument which convinced you that the truth of theism is quite unlikely indeed. In that case, Pascal’s Wager provides a rational reason to continue to believe in God. For, even if it is unlikely that God exists, the utility of believing that God exists has a potentially infinite reward and thus trumps the utility of not believing that God exists. Remember, though, that this functions for any possibility of God existing that is greater than zero. It was at this point in the book that I realized that Pascal’s Wager is a much stronger argument than I had thought. Not only may it be adequate to ground theistic belief, but it also may serve as a kind of bulwark against anti-theistic arguments as well. I have argued that Pascal’s Wager may be formulated in such a way that one should believe in God. Now there is, of course, much more nuance and many more objections to each premise. Interested readers should check out Jeff Jordan’s Pascal’s Wager: Pragmatic Arguments and Belief in God. Question of the Week: Wagering Much?– In this post, I asked the question of apologists about whether or not they used Pascal’s Wager. The feedback I got was diverse and interesting. Check out the post, and let me know your own thoughts.